Counselling Directory wins silver prize at Surrey Digital Awards 2017. Counselling Directory’s “Breaking the Barriers of Bullying” campaign video was celebrated Thursday night at the Surrey Digital Awards 2017. The video took home the silver prize in its “use of video for business” category. The video was created for the national anti-bullying week in November by video content agency NRG Digital of Farnham. The film features actors aged 10 to 70, telling true stories of people who were affected by bullying at different stages of life, from school age to adulthood. Counselling Directory Marketing Communications Executive Ellen Hoggard, who led the project, explains, “For anti-bullying week, we wanted to focus on the fact that bullying, sadly, occurs at any time of life, not just in the school playground. The film brings a tear to your eye, before lifting you back up. The most important part of the film was showing that there is a way out and if you’re going through a dark time, you’re not alone and help is available”. “We’re thrilled to have won silver for our first major video”, Ellen said. “Our team are passionate about helping people and raising awareness, and it really is incredible to have made a small idea an award-winning reality. It’s an honour to have worked with such a great team – both Memiah and NRG – and I look forward to future projects”. “Winning silver last night was a real achievement – both for Counselling Directory and for bullying awareness”, NRG Digital Creative Producer James McLauchlan said. “It’s a testament to the great collaboration between the teams at NRG & Counselling Directory, and the fulfilment of a brilliant concept. Working on this project has been extremely rewarding, and to have everyone’s efforts recognised has been the icing on the cake”, he said. 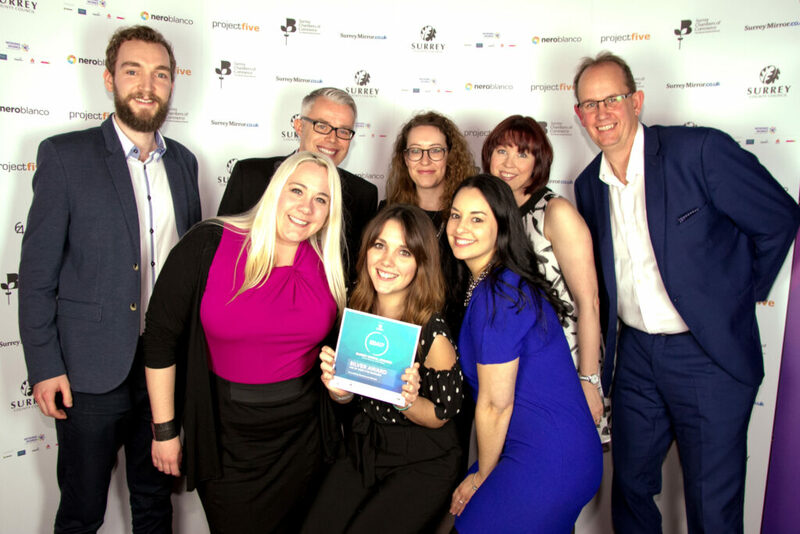 In its third annual award ceremony celebrating the online achievements of Surrey businesses, charities and schools, the Surrey Digital Awards featured honours in 15 categories including those for websites, blogs, mobile apps and social media. The awards ceremony was sponsored by the Surrey County Council. To watch the award-winning film or to get more information about bullying, visit our bullying page.